Even veteran drivers can feel a little skittish around trucks when we’re barreling down the highway over sixty miles an hour. When we’re a matter of feet away from a several-ton wall of steel and freight on wheels, it would be crazy to not feel a little nervous. And as a trucker who has spent more than fifteen years double checking mirrors and dodging near-hits around all manners of drivers, I can assure you that truckers feel the exact same way around passenger vehicles. Truck accidents are a terrifying event for anyone, but the fact is that the majority of them are caused by passenger vehicles. FMSCA’s studies demonstrate that 58.8% of truck accidents are due to the actions of other drivers, and an additional 14.4% are due to pedestrians and others involved in collisions. In total, only about 21% of truck accidents are attributable to the trucker. Why are such a high number of truck accidents caused by others, and how can we avoid these issues? Avoid remaining in a trucker’s blind spots. These are much larger than many people realize, but a helpful rule of thumb is that if you cannot see a truck’s side mirrors, then there is no way that they can see you. If you must pass these areas, make your stay is as brief as possible. And of course, never access these areas when a trucker is flashing a signal to change lanes. Keep a healthy distance from any trucks in front or around you. Truckers are well trained to avoid traffic accidents through rigorous CDL test standards, but the limitations of driving a heavy load can make quick movements unmanageable. Paying special attention to any signals or gestures that truckers might make on the road can help you predict their movements more carefully as you navigate the lanes. Refrain from erratic or aggressive driving behavior around trucks. While cutting off another driver to reach an exit might work in staying on route, doing so in front of a truck can result in a collision. Trucks are much slower in deceleration than average vehicles on the road, so skittish behavior can spell out disaster in the blink of an eye. Recognize the risks of fatigued driving. 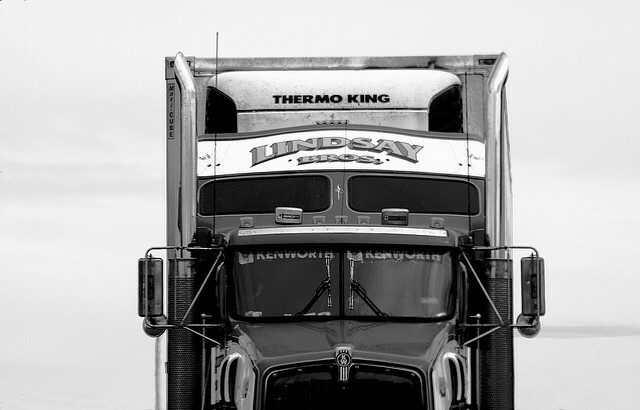 Driving for hours-long stretches is always a difficult process, but it’s a way of life for truckers. Many sign up for fatigue management training courses just to maintain good form while driving fatigued. It’s important to realize the risk you present to yourself and others if you decide to take hold of a steering wheel on nothing but catnaps and coffee. While it’s rational to be nervous when navigating around truckers, it never needs to be dangerous if you keep your wits and follow safe driving practices. And always remember: if you witness truckers or any other drivers operating their vehicles in a reckless manner, always inform your highway department to make sure that nobody else is in danger of an accident.